This beautiful rainbow bracelet is handmade to order and is ideal for remembering someone who was colourful and full of life. Some people deserve to be remembered with rainbow colours and this bracelet was designed to give a more delicate alternative to our popular rainbow bracelet with cats eye beads. This version is made with Sterling silver and Swarovski crystals in rainbow colours. This memorial bracelet is perfect if you are buying as a sympathy gift in support of someone who is grieving or a special piece of remembrance jewellery for yourself. 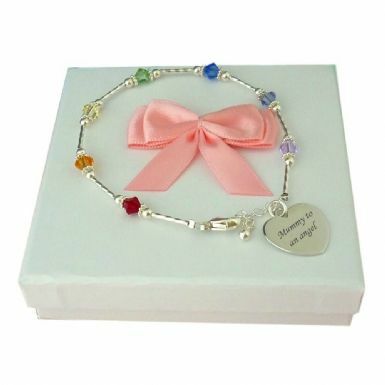 Each rainbow bracelet is lovingly presented in the gift box shown with the free "Thinking of you" gift card included in case you wish to handwrite a personal message for someone inside.